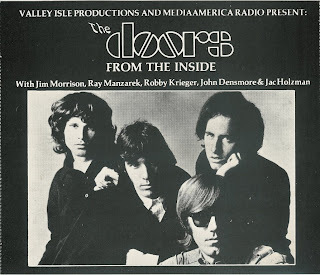 "From the inside" is a Radio-documentary/show, realised by Valley Isle Productions Ltd. and MediaAmerica Radio Inc., with the partecipation of Jac Holzman (manager of Elektra Records), as The Doors' story-teller and includes musical contributions by Ray Manzarek and Robby Krieger. This show consists of 6 CD's and I think it's very nice for a fans to have this opera as indirect testimony of this great band. Enjoy it! 1970: Back to basics: "Morrison Hotel"
"L.A. Woman", Jim's departure for Paris, and the Doors today. very cool contribution Paolo, great contribution, very complete document, listen to bits of pieces of background, listening to the show is very magical, great contribution, have a good one!!! Thanks for your words Cato, very soon the CD2 online! muchas muchas gracias por el excelente material!!!!!!! !